Relive the thrill-packed search for the Ark of the Covenant! Canvas art print measures 36-inches wide x 24-inches tall. Inspired by Indiana Jones and the Lost Ark. Hand-numbered limited edition of only 95 pieces that includes the artist's authorized signature! Relive the 1981 action-adventure film that pits Indiana Jones against a group of Nazis in a thrill-packed search for the Ark of the Covenant! 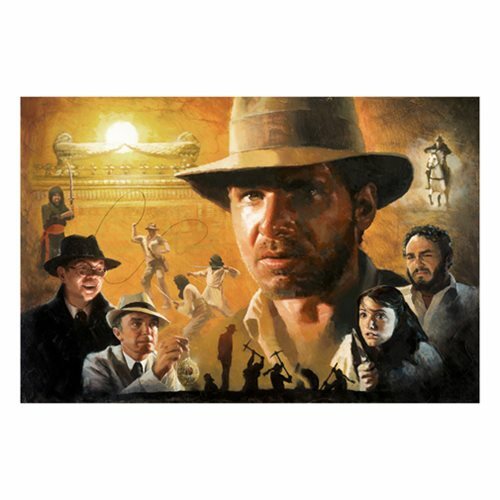 This unframed interpretive artwork by artist Christopher Clark measures 36-inches wide x 24-inches tall and presents a fascinating image of Major Arnold Toht, Dr. René Belloq, Indy, Marion Ravenwood, Sallah, and others from Indiana Jones and the Lost Ark. The Indiana Jones Ark of the Covenant by Christopher Clark Canvas Giclee Art Print is a hand-numbered limited edition of only 95 pieces that includes the artist's authorized signature and a certificate of authenticity.